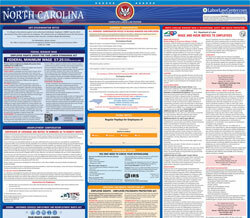 The Unemployment Insurance Poster is an unemployment law poster by the North Carolina Department Of Labor. This is a mandatory posting for all employers in North Carolina, and businesses who fail to comply may be subject to fines or sanctions. This poster must be posted in a conspicuous place where all employees will see it. This poster describes how to qualify for Unemployment insurance and where to contact should you become unemployed so you can file a claim for unemployment. It appears you don't have a PDF plugin for this browser. Please see the link below to download north-carolina-ncdes-524e.pdf. checks for unemployment insurance purposes. cessed in Raleigh, North Carolina. Please be sure that your employer has your correct mailing address. ccommerce.com/workforce to assist you in securing suitable work. DWS provides a wide variety of services free of charge. Employment Security at des.nc.gov, or by phone at 877-841-9617.
urity at the address shown on the bottom of this poste r.
copies may be obtained on-line at des.nc.gov. DES highly recommends posting this information.